Use the Data Logger window to create a schedule of jobs, run the schedule, and view live data on the Dashboard. A schedule is a collection of jobs and settings that specify when to run each job in the job list. You can schedule the order of jobs to run, when you want the schedule to start running, and how often to repeat the schedule. When you run the schedule, each job included in the schedule is run in sequential order. Only one schedule can be opened for editing at a time. Schedule settings can be saved to a configuration file and imported for use. Saving a schedule also saves all of the jobs listed in that schedule. A job defines the data acquisition task. A job is a collection of channels with timing, triggering, and logging properties that represent the measurement or generation to perform. You can run one job individually, or as part of a larger schedule of jobs. Job settings can be saved to a configuration file and imported into existing or new schedules for use. You create new jobs using the Job Editor which is available from the Data Logger window Schedule tab. Note: Only one user is defined (admin). By default, any user can create or modify a job and schedule, and read, write, and delete files stored on the WebDAQ device's media. A password can be created to limit access to the web interface of the WebDAQ device. Once a password is set, the level of security can be configured to require the password for access to the web page (including reading data) or to allow any user to read data, but to require the password to make any changes to jobs, schedules, or files through the web page. The Data Logger Schedule tab displays by default when you open the Data Logger. The image below shows a typical window for a Schedule with two jobs. The right pane summarizes the options configured for the selected Schedule or job. 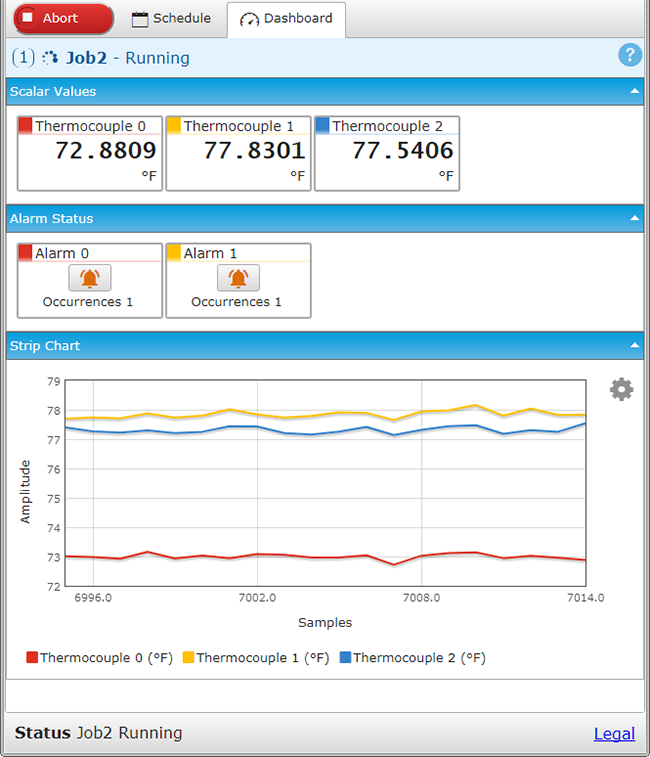 The Data Logger window includes a Run All button, Schedule tab, and Dashboard tab. The Run All button executes the schedule. All jobs in the schedule run sequentially. The Schedule tab displays the job list, the status and configuration of the selected schedule or job, and a toolbar to perform job and schedule tasks. When a job is running, the Dashboard tab shows live data from the currently running job. When no job is running, the Dashboard displays either the status and most recent data for the selected job, or the status of the Schedule if no job is selected in the job list. Tap a topic below for additional information about each Data Logger component. The Schedule tab displays the current status, the job list, a configuration summary, and tool bar for performing job and schedule-related tasks. Tap next to a job name to run the job, or to stop the job. Note that you cannot run an individual job that has dependencies on other jobs, such as a "Jump to Job" alarm. Job configuration options are discussed in the Job Editor topic. New Job Opens the Job Editor for you to create a new job configuration. Edit When a job is selected, opens the Job Editor populated with settings for the selected job. When the schedule is selected, opens the Schedule Settings dialog box to configure schedule options. Duplicate Job Creates a copy of the selected job in the job list using the "Job#" job name. Delete When a job is selected, deletes the job from the job list. Save the job first if you plan to use it again. When the schedule is selected, deletes the schedule and restores schedule settings to default values. A dialog prompts for confirmation to complete this action. Move Down Moves the job down in the job list. Jobs are run sequentially according to the order of this list. Move Up Moves the job up in the job list. Displays options to save a job or schedule to a file, import an existing job file to the job list, or import a schedule file to replace the job list. Both job and schedule configuration files are saved with the extension "*.json". You can download saved jobs and schedules to a local drive and upload either to this or another device; refer to the Data Files window Files tab for more information. Save To File: Opens the Save Job As dialog box. Job settings are saved in a configuration (*.json) file in the specified WebDAQ location (Internal Storage or attached media). Import From File: Opens the Import Job dialog box for you to select the job file to import to the job list from the device internal storage, or external media, if present. Save To File: Opens the Save Schedule As dialog box. The schedule settings, the job list, and the Job settings for all of the jobs listed in the schedule are saved in a configuration (*.json) file in the specified WebDAQ location (Internal Storage or attached media). Import From File: This operation removes all jobs in the current schedule; a dialog box displays for confirmation. When confirmed, opens the Import Schedule dialog box for you to select to the *.json schedule file to import from the device internal storage, or external media, if present. The selected schedule and all of its associated jobs are imported. Schedule Settings Opens the Schedule Settings dialog box to configure when to start the schedule, how often to repeat the schedule, and whether to stop the schedule and cancel any remaining jobs if an error condition is detected. 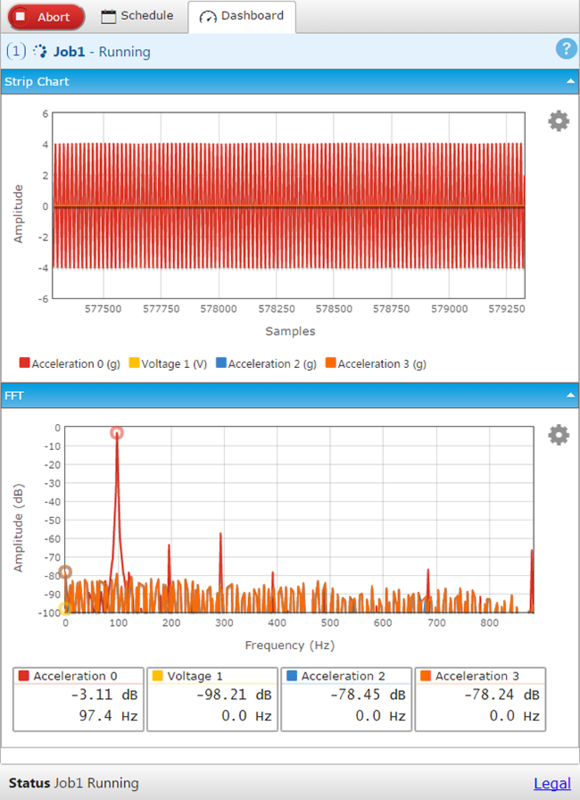 The Dashboard shows data on scalar displays, the status of each alarm, and plotted on a strip chart. Each of these displays can be hidden (minimized) by the user. The Dashboard displays time domain data on a strip chart, and frequency domain data on an FFT display. The alarm status is also displayed, when configured. Each display can be hidden (minimized) by the user. When viewing FFT data, the maximum peak values are optionally displayed on the data plot and in the legend below the plot. The FFT size for display purposes is calculated based on the sample rate to achieve a resolution bandwidth of approximately 1 Hz. You can minimize individual scalar and alarm displays, show/hide channels on the strip chart, and view/reset alarms on the Dashboard. You can minimize individual displays, show/hide channels on the strip chart and FFT displays, and view/reset alarms on the Dashboard. Tap the color swatch on a scalar or alarm display to minimize the display for that channel. Tap the color swatch on a strip chart or FFT display to toggle the channel on the display on and off. Tap on an active alarm icon and select Reset to manually reset an alarm (not available if the reset configuration is configured for automatic). To reset an alarm condition automatically if the condition is resolved, refer to the options on the Job Editor Alarms tab. Select the gear icon on the Strip Chart display to open the Strip Chart Settings dialog box and select Y-axis scaling options and X-axis units. All changes made to the dashboard display of a job prior to the acquisition are retained in the job description, and will be applied to all future acquisitions of that job. Changes made during the acquisition are not retained in the job description, and will not be applied to future acquisitions of that job. When viewing FFT data, select the gear icon on the FFT display to open the FFT Plot Settings dialog box to set the window type per-channel, show or hide the peak frequency on the FFT plot, and to set y-axis range values. Tap to execute the Schedule and run each job in the job list. The blue Run All button changes to a red Abort button. The schedule start condition is evaluated, and the first job starts when this condition is met. Each job in the job list is run in sequential order. Data displays on the Dashboard as it is acquired. 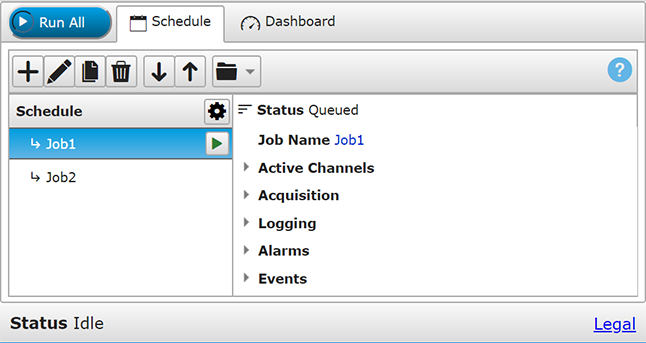 The current job status displays on the Schedule and Dashboard tabs; examples are Running, Stopped, Completed, Running (waiting for a trigger), or Queued. The current system status displays in the lower left corner; examples are Idle or the name of the currently running job. To stop a job configured for manual stop, or to cancel a job configured for any other stop type, but to continue running remaining scheduled jobs, tap the Stop icon next to the job in the job list. To cancel all jobs in a running schedule, tap the red Abort button. This will cancel the currently running job and any remaining jobs in the schedule will not run.